1 of GoPro Inc.'s Worst Investments: Itself? This repurchase program was bad, but it could have been worse. In Oct. 2015, GoPro (NASDAQ:GPRO) announced that its board of directors had authorized a $300 million share repurchase program. "Our newly authorized Class A share repurchase program runs for 12 months allowing us to remain opportunistic buyers and return cash to shareholders," said GoPro CFO Jack Lazar, who has since resigned, in the company's third-quarter earnings call. The stock fell about 67% in the 12 months leading up to the board's authorization for the repurchases. So, on the surface, it may have looked like GoPro was poised to buy its stock at a discount. But, as time would tell, this was far from the case. In its fourth quarter, the company subsequently repurchased about 1.5 million shares, spending about $35.6 million. As shares proceeded to plummet even further, this may have been one of GoPro's worst investments ever. When GoPro started executing its share repurchase program in the fourth quarter of 2015, shares were trading much higher. Since GoPro's board first authorized its share repurchase program, its stock has fallen an incredible 62%. This means any repurchases made in the fourth quarter of 2015 were purchased at a significant premium to where shares are trading today. To be exact, GoPro bought back shares at an average price of $23.05 -- a whopping $135% premium compared to its stock price at the time of this writing. In other words, GoPro's $35.6 million investment in itself is now worth only about $15.2 million. That's essentially over $20 million gone. To its credit, GoPro did stop repurchasing shares as shares fell throughout 2016. Indeed, not a single share was repurchased during 2016. This prevented what could have been a very destructive repurchase program. By putting its repurchase program on hold, the company saved millions of dollars that would have been virtually erased if it had continued to overpay for its stock. It's tempting to excuse GoPro's ill-timed repurchases after considering how the company at least had enough sense to halt the program as its business faced significant headwinds during 2016. But though $35.6 million spent on repurchasing shares seemed like a small amount at the time, it seems much bigger today; GoPro had about $280 million in cash and cash equivalents when the program was announced, but has just $132 million on its balance sheet after a very difficult 2016. Interestingly, with GoPro stock now trading below $10, repurchases today might actually be a good idea if it weren't for the company's much worse cash position. With only $132 million in cash and cash equivalents, GoPro simply doesn't have the cash lying around to pull it off. Furthermore, considering the competitive challenges GoPro is up against, the company's cash may arguably be better spent on research and development. So, GoPro's stock might be cheap enough now for repurchases, but the underlying business may not be able to support any meaningful buyback program. All of this brings up one interesting theoretical scenario to think about: What if instead of announcing a repurchase program in the third quarter of 2015, GoPro instead doubled down on product development and execution? Could GoPro have strengthened its offerings, launched products faster, and mitigated some of the blow it was dealt by rising competition? To be fair, it's always easier to criticize share repurchases in hindsight. 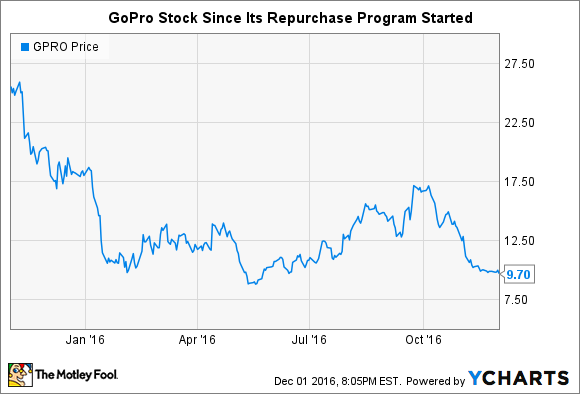 Nevertheless, GoPro's ill-timed buyback program shows how some share repurchases can not only fail to create value but even diminish it.